Built on the banks of river Manzanares, Madrid is the capital city of Spain. It has an industrial city with not just ample production but also consumption and consequently has a strong economy backed with rich culture and heritage. The CSD training in Madrid will provide an opportunity to build your career and take you an edge over the others. It is a 5-day long workshop inclusive of lectures from the very basics of the CSD course in Madrid to the advanced technical aspects of it. 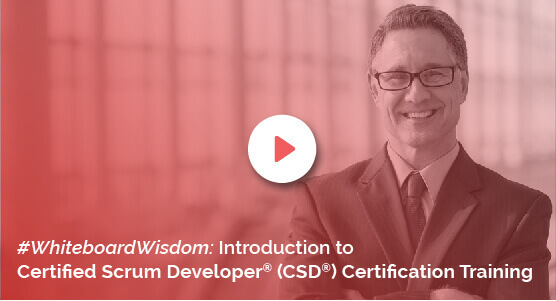 At KnowledgeHut, the tutors are experts in their fields and will begin with introductory e-learning of the CSD certification in Madrid, followed by coaching on the electives on the second day. Day 3 and 4 will focus on the demo given by the trainers and classroom practice sessions on the technical aspects of CSD training in Madrid. On the fifth day, there will be a complete revision of the material given to you by the academy so as to strengthen your hold on the course. At a very nominal cost, you get a lot of benefits with the Certified Scrum Developer training in Madrid when you enrol in the course brought to you by our institute. You get a 2-year membership with Scrum Alliance along with the Scrum Alliance approved course material. KnowledgeHut has successfully found a way to give the full worth of the fee you pay by not only giving unparalleled certified scrum developer certification in Madrid but also gives you additional benefits like 100 days free access to our Agile and Scrum e-learning programme along with practical experience of working with Scrum tools. So grab this opportunity and register yourself now!